Something’s wonderfully rotten in Canada. Perhaps it’s just my own proximity to our northern neighbors (I’m just three hours or so from the border), but with the influx of quality music sent my way from a land of Winters that are even longer than those of Northern MI, I can’t shake a feeling that Satan himself has set up some mystic data center, converting minds to his cause via the propogation of a Black Metal evilnet. And at the epicenter of this music-laden Luciferian Superhighway spewing worldwide from the tundra, two acolytes/network engineers tirelessly toil under the name of Gevurah. Tasked are they with bringing you sonic hell suffused with ample amounts of fury and guitar-driven depth. At a total of 33 minutes (some of which are dedicated to an excellent Malign cover), Gevurah get in, ravage with chord-bending riff lessons taken from Deathspell Omega, and quickly get out; not caring if you as listener get enough out of it or not. And that attitude – to pillage and repeat with an unbridled arrangement-rage – permeates each second of the album, and thus said rage becomes Necheshirion’s strength. Herein, distorted guitars twist and churn out a fog of transporting, transfixing darkness, seeking and not failing to put you in a susceptible state. Afterward, the mere suggestion of embracing The Left Hand Path feels like ‘the right thing to do’. 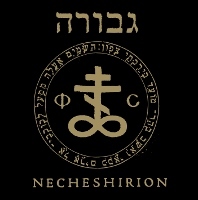 And while Gevurah glaze eyes primarily with hyper-riff reverbed assaults, it is the slow relentlessness of standout track ‘The Throne of Lucifer’ and the (mostly) mid-temp creep ‘Divine Ignition’ that hypnotizes most effectively with a crazed dissonance not unlike those emanating from the Clandestine Blaze back catalogue. ~ by cliftonium on May 1, 2013. This entry was posted on May 1, 2013 at 7:02 pm and is filed under ALL REVIEWS, G-reviews.You can follow any responses to this entry through the RSS 2.0 feed.You can leave a response, or trackback from your own site.